Fresh from his victory at Barnet, where he defeated the Earl of Warwick and reclaimed his throne, Edward IV now sought to annihilate the Lancastrian dynasty. 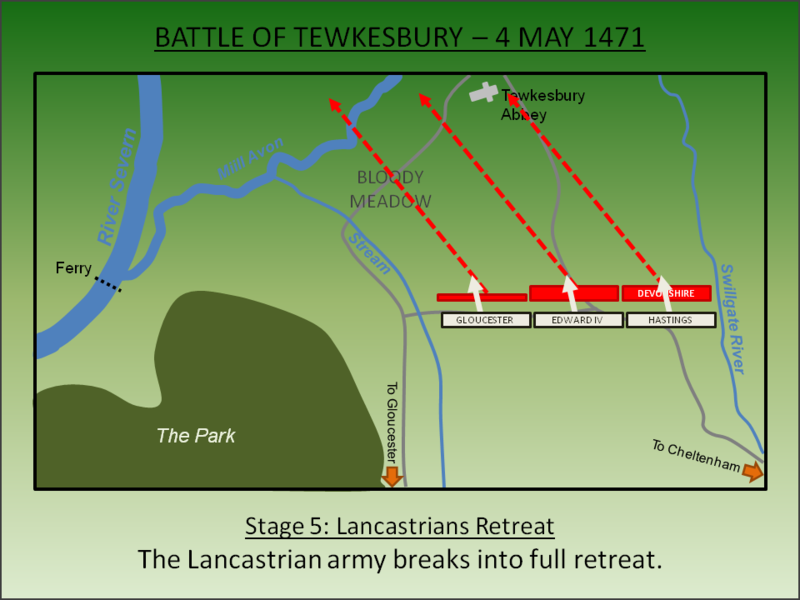 On 4 May 1471 at the Battle of Tewkesbury he almost achieved this aim when his forces routed the Lancastrians and killed Henry VI’s only son and heir. Edward IV had seized power in 1461 following his decisive victory at the Battle of Towton. Although he would later capture the deposed Henry VI, a 'court in exile' was established by Queen Margaret along with her son Edward, Prince of Wales. Edward IV was briefly overthrown when one of his former allies - Richard Neville, Earl of Warwick (the Kingmaker) - joined with the Lancastrian cause. Supported by Louis XI of France, Warwick invaded England forcing Edward IV to flee. Henry VI was briefly restored but Edward IV returned, raised an army and defeated Warwick at the Battle of Barnet (1471). Once again Henry VI was imprisoned in the Tower of London. On the 14 April 1471, the same day as Barnet, Queen Margaret returned to England with a second army headed by Edmund Beaufort, Duke of Somerset and including Edward, Prince of Wales. Landing in Weymouth the news of Barnet quickly reached them and accordingly Somerset decided to head north to Wales where he could expect reinforcements and support from Jasper Tudor. Edward IV deployed to intercept the Lancastrian force in order to kill Edward, Prince of Wales and end the dynastic struggle. The Lancastrian force initially made for Gloucester, the nearest crossing point over the River Severn. However they were desperately short of provisions and detoured to Bristol. The delay allowed sufficient time for Edward IV to arrive in the vicinity and on 2 May 1471 both forces were in the proximity of Sodbury. Somerset was keen to avoid battle until reinforced and he skilfully tricked Edward into thinking that the Lancastrians would give battle at Sodbury. By the time the King realised it was too late and his opponents were miles ahead of him marching towards Gloucester. There they hoped to cross the River Severn by the town's bridge whilst concurrently protected by the city's defences. Edward set out in pursuit and sent messengers ahead to Gloucester informing the Governor, Sir Richard Beauchamp, that he was approaching. Upon the arrival of the Lancastrians, Beauchamp flatly refused to open the city gates. With Edward now just hours behind them, the Lancastrians had little choice but to march on to Tewkesbury, the next crossing point over the River Severn. But here there was no bridge - instead crossings were made by ferry and to ship the entire army across would take hours. When the Lancastrians arrived in the late afternoon, it was too late to commence a crossing and besides Edward was too close; rather than risk a rout of his force as they attempted to cross the Severn, Somerset prepared defensive positions assuming a battle would be fought next day. Edward's force, unable to make Tewkesbury before dark, camped at Tredington (around 2 miles to the south-west). The size of the two armies is a matter of some conjecture. Some historians suggest Somerset had the larger force but he was clearly very cautious of the opposition; possibly because he lacked faith in a significant portion of his own army whilst also noting how effective Edward's had been at Barnet. He deployed in the traditional three battle array. He commanded the vanguard whilst the centre was nominally under the command of Edward, Prince of Wales although effective control was exercised by Lord Wenlock, a turncoat who had formerly been a Lancastrian (at St Albans) and then Yorkist (at Towton) before changing sides once again. 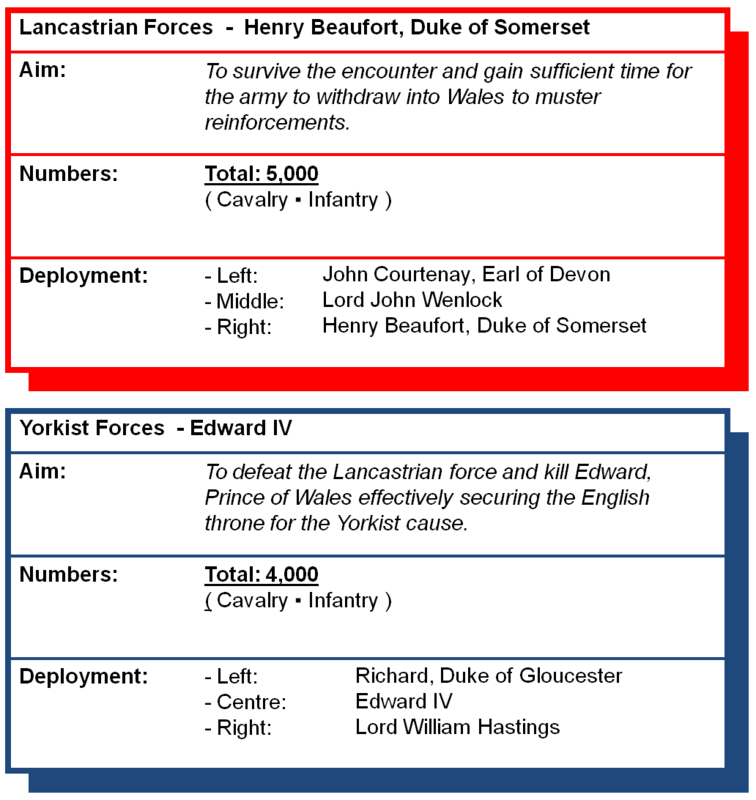 Edward IV also deployed in three battles. He commanded the centre (although effective control may have been delegated to the Duke of Clarence). Richard, Duke of Gloucester (later Richard III) commanded the left. The battle was fought on 4 May 1471. Somerset deployed his force to the south of Tewkesbury Abbey with his position protected by a hedge-lined road that ran east-west in front of his line. His intent was to conduct a flank attack on the Yorkists concurrent with Lord Wenlock attacking with the rest of the Lancastrian army in the centre. However, Edward IV foresaw the danger to his left flank and positioned a small force of spearmen on the high ground to the west, a wooded area known as The Park. The battle commenced with an exchange of artillery fire. It is likely the Yorkists had the better of this for they inevitably brought ordnance with them from Barnet. The Lancastrians probably only had a limited number of guns that they had collected at Bristol. Somerset now commenced his flanking action. Using the topography, trees and a screen of additional soldiers as cover, he slipped round to the west of the main battle and launched his flank assault on Edward's left. The Yorkist infantry was caught unawares by Somerset's attack and started to fall back but then the Lancastrian plan unravelled; Wenlock did not attack in the centre as planned and, seeing the main assault on the left, Edward deployed his spearmen to surround Somerset's force. Now faced with attacks on two sides - from both the Yorkist left and the spearmen - Somerset's men fell back and then broke. The troops fled the battlefield with many attempting to escape across the field now named 'Bloody Meadow'; a not so subtle reference to the slaughter that followed. Somerset escaped and returned to his own lines where he promptly killed Wenlock with a battle-axe for his failure to attack. The battle, however, was lost; the Lancastrian centre was now leaderless and the entire army broke into rout. Many attempted to escape by swimming the River Severn. The Lancastrian losses were in the region of 2,000. Crucially Edward, Prince of Wales - the son and heir of Henry VI - died in the encounter. Whether he was killed in battle or subsequently murdered is uncertain. Shakespeare, in Henry VI Part 3 (Act V, Scene V), has the defiant young Prince murdered by the Duke of Clarence. Another account suggests he was found in the immediate aftermath of the battle, identified and summarily executed. Either way Edward IV knew that whilst the Prince lived there would always be a rival who would be a rallying call for opposition to his rule. Furthermore this was the grandson of Henry V, the great Warrior King, whose historical exploits were held in much higher esteem than the lacklustre reign of Edward IV; from the Yorkist perspective the Prince of Wales could not leave the battlefield alive. 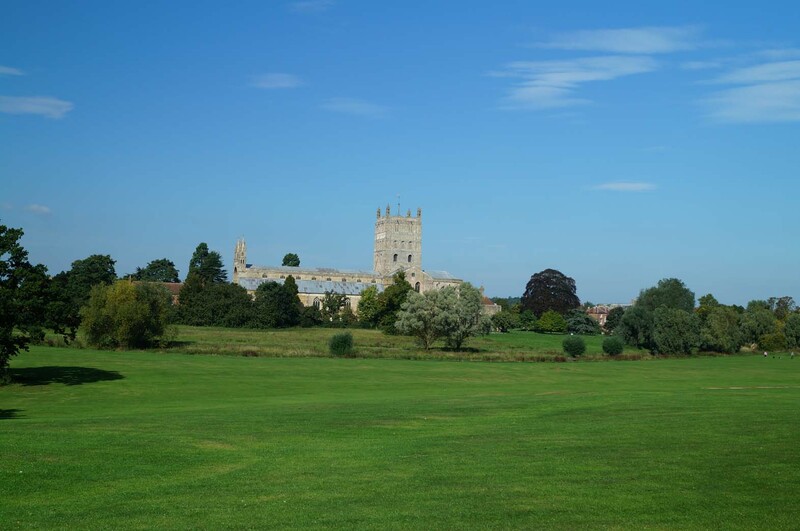 Somerset was also targeted and, despite seeking sanctuary in Tewkesbury Abbey, was dragged out where he was tried and executed in the subsequent days. Overall the battle was a decisive Yorkist victory with the only viable Lancastrian heir eliminated. This cleared the way for Edward to arrange the murder of Henry VI, who was already a prisoner in the Tower of London, and achieved the virtual annihilation of the Lancastrian line and imprisonment of Queen Margaret. Edward would now rule as undisputed King for the next 12 years but his unexpectedly early death would open a final opportunity for the Lancastrian cause. Edward IV left two young sons who were deposed (and possibly murdered) by his brother Richard, Duke of Gloucester (later Richard III). This helped create conditions suitable for the very last Lancastrian claimant - Henry Tudor - to invade and whose victory at the Battle of Bosworth Field (1485) ended the Yorkist era. Blyth, J.D (1961). The Battle of Tewkesbury. Bristol and Gloucestershire Archaeological Societ, Bristol. Bruce, J (editor) (1838). Historie of the Arrivall of Edward IV. Camden Society, London. English Heritage (1995). Battlefield Report: Tewkesbury 1471.Swindon. Hall, E (1809). Chronicle. London. Lancaster, J.H.D (2014). Tewkesbury: Battlefield visit notes and observations. CastlesFortsBattles.co.uk. Ordnance Survey, 2016. Tewkesbury. 1:1250. Southampton. Ransome, C (1889). English Historical Review.. London. Smith, T (editor) (1909). The Itinerary of John Leland in or about the years 1535-1543 Parts VII and VIII. London. 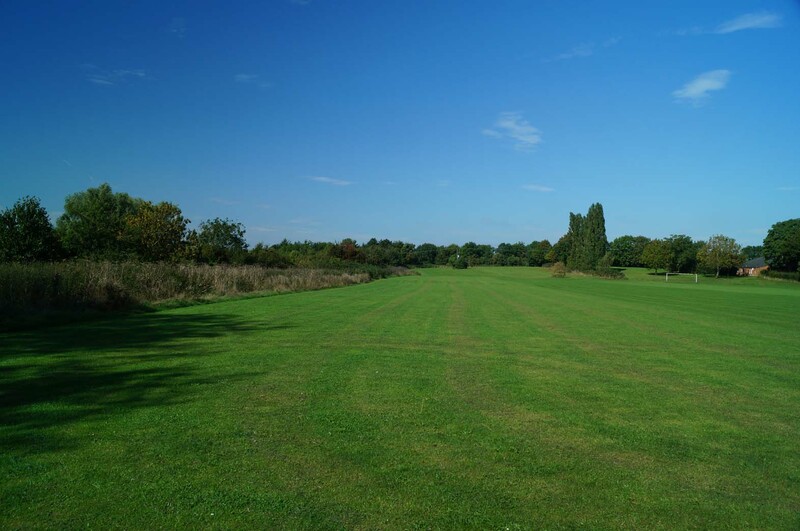 Portions of the battlefield are now under modern housing whilst bloody meadow has been converted into a football ground. Nevertheless the area of the battlefield can be walked (and there is a battlefield trail/footpath) that captures the key components of the battle. The monument, pin-pointed on the Google map below, is in the vicinity of the abbey although the bulk of the fighting was done to the south along Gloucester Road. We recommend starting at the Abbey and following the trail from there. Monument. 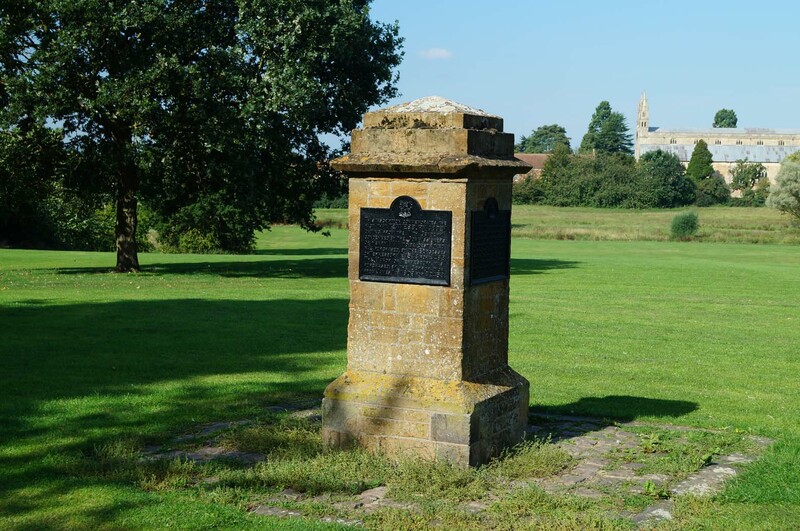 The site of the monument and the Abbey itself are well to the rear of the Lancastrian position and the battlefield. Once the troops broke into rout however they came through here as the fled the scene. The Duke of Somerset himself sought sanctuary in the Abbey but was dragged out and executed. Bloody Meadow. The area where many of the Lancastrians were killed as they retreated became known as Bloody Meadow. Today it is a football pitch although it is marked by an information board. Battlefield. Much of the battlefield is now developed although small areas give an idea of what the terrain was like in 1471. The battle was fought over a large portion of the local area; from the Abbey and down Gloucester Road. Bloody Meadow, scene of the final rout is nearer the waterfront. Car parking is available.